Hong Kong cheese are the three words that come to mind when describing Ching Yip Coffee Lounge. I mean it figuratively and literally. For where else would you find the happy collision of East meets West in this Hong Kong-style cafe that brings you the culinary delights of spaghetti bolognaise grilled with shredded cheese; spaghetti with ham in white sauce grilled with shredded cheese; and fried pork chop with spaghetti in creamed corn (all $9.00). The Dixon House basement food court has often been a favoured cheap eat of mine, but until I received a few emails of recommendation, I'd never thought to take the escalators up to the second floor. It's like a step back in time, a flashback to 1970s Sydney with stark lighting, functional but mainly bare offices, and no end of Chinese travel agencies and massage parlours. 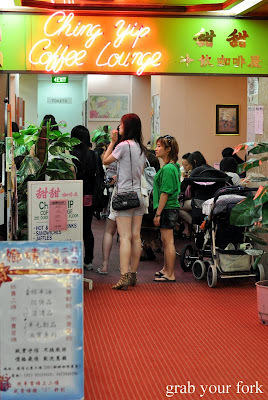 At the end of the corridor is the lurid but strangely alluring neon sign of Ching Yip, and despite its somewhat hidden location, this cafe is no stranger to Chinese locals, who pack the place out every lunch time. The menu is a laminated A3 sheet of paper in pink. It's a huge selection that runs the gamut of snacks, sandwiches, rice dishes, pasta, fried noodles, hot pot rice, curry dishes, noodle soups and Hong Kong-style charcoal grills. I can't help but marvel at the soups which range from Russian bortsca to Szechuan-style hot and sour soup to cream of chicken and corn soup (all $4.20). The waitress scuttles over within minutes of us being seated and asks what we'd like to order. We politely ask for more time, for how can we choose when faced with options that include a fried egg and tomato sandwich ($3.80), condensed milk and peanut butter toast ($3.00), french toast ($4.50) or bacon and egg on toast with chips ($7.50)? I do love a good Asian drinks menu, and in addition to the usual Horlicks ($3.20) and Ovaltine ($3.20), they have the hot tea and coffee mix ($3.50) I've yet to fully appreciate, as well as a hot lemon Coke ($3.80) which I'm told is very common and popular (Coke with fresh lemon heated til hot). "Are you ready to order yet?" The waitress is quite persistent by now, a bit perplexed by our hesitation. Ching Yip customers tend to be regulars, and they know what they're having even before they've sat down on their chair. The G-man and I take the easy option. The Daily Set Menu includes a house soup, rice dish and tea or coffee. 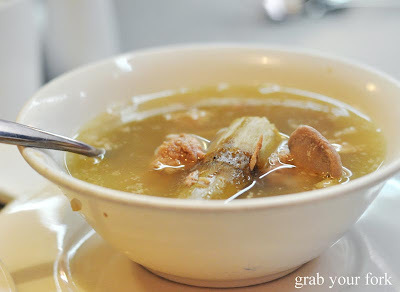 The soup of the day is a clear pork broth that comes with bits of pork, pork bones and halved lengths of fresh sugar cane. 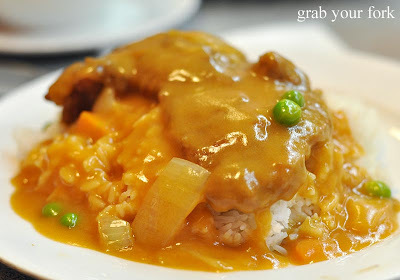 The fried pork chop and rice with tomato sauce comes in neon orange, the glossy thick sauce shimmering over the mound of white rice and deep-fried pork chop. The pork chop is tender with a delicious golden crust that's made somewhat soggy by the generous slather of sweet and sour tomato sauce. This is Hong Kong comfort food. Chewing is always an option. 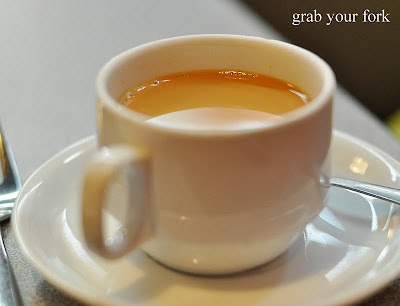 I normally take my tea black and without sugar but the Ceylon tea Hong Kong-style is so strong, you can feel the back of your throat go dry in an instant. Tea leaves are usually boiled in water over the stove until a thick brew is reached. It's a strong hearty drink that needs a teaspoon of sugar, more likely two. 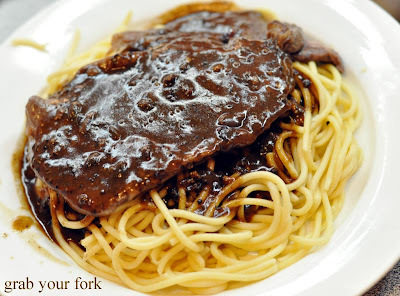 The fried beef steak with spaghetti in black pepper sauce is a thin and tender beef slice drenched with a surprisingly peppery gravy. There's so much pepper it borders on tongue-tingling. A tangle of spaghetti is more well-cooked than al dente. Beef in tomato sauce with rice is another tribute to the joys of sloppy comfort food. Again the beef slices are tender, joined by a medley of carrots, peas and tomato and coated in a thick glistening sweet tomato sauce. Afternoon tea (3pm-5pm) offers some great food and drink deals that range from $5 to $7 and if you've ever wondered if you can still get banana splits ($5.00) or banana fritters with ice cream ($6.50), I suggest you take a little ride up an escalator or two as well. Ah Ching Yip! Or as we locals call it, Teem Teem (which means Sweet Sweet) in Cantonese. You must go back again for the afternoon tea of chicken wings! They're probably Ching Yip's most famous dish. Marinated in soy, it's a real beauty, since I know you appreciate your fried chicken. And the spag bol with shredded cheese is truly comfort food. Reminds me of HK.. 'cept where's the "mandarin ducks" tea? That drink of half coffee and half tea? You didn't try the hot lemon coke? I'm curious about it. The condensed milk and peanut butter toast sounds amazing too. It would be so gooey. Oh, thank you! I’m Ecstatic that you’ve found a place that serves hot lemon Coke! It is the best thing if you have a cold or flu. It is becoming a rare drink even in Hong Kong cafes. And to make it at home, you have to boil the Coke in a saucepan to get it really hot yet fizzy – a microwave won’t do. Let me know when you want to sneak out for an afternoon tea, or we can go for late lunch.... chicken wings and condensed milk and peanut butter toast, YUM! I really think you have to go back for that hot lemon coke ;D a Hong Kong speciality.. its especially great with some grated ginger. I tried making it at home, but its not the same. I've totally forgotten about this place since I finished uni years ago. Thanks Helen for re-introducing this place :) I love their condensed milk and peanut butter toast! Steak and spaghetti? With a whole steak? I guess to be fair, it fits in with the other eclectic menu items. Hot lemon coke seems like a nice thing to have on a cold day. OOohh this place really seems like it was set in the 70s hee hee and a typical HK cafe with all the spaghetti and steak combinations! I like the sound of cheese and cheese and more cheese though and of course PB + condensed milk mmmm ^^! Oooohhh I love this place! 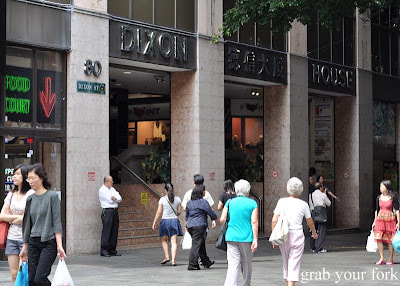 I used to go there almost every weekend when I was still in school to have their pork chop rice with sweet corn. You should try it! It's the best! Oh and of course their ice milk tea. Some very interesting items on the menu. I am shocked no one else thinks that the hot lemon coke is strange. Coke must be enjoyed ice coke. Warming it up just seems wrong. These type of places rock! 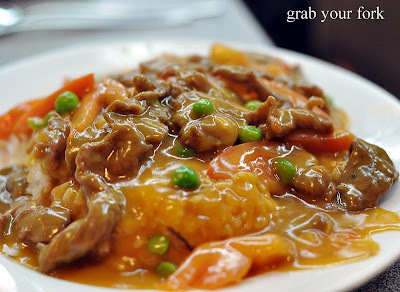 During uni we use to head to Cafe De Campbell in Chinatown which has similiar HK style of random food. Arwen - you gotta try condensed milk on slices of fresh white bread - it was a childhood favourite. this post was so entertaining - I kept wavering between fascination and cringeing. I used to work for a HK couple and they regularly drank 1/2 tea 1/2 coffee beverages as well as eating steak with spaghetti. Hot coke and lemon - I can imagine all that sugar and caffeine would pep you up on a cold winter's day. I imagined "afternoon tea" to be a sweet dish & beverage, I cannot wait to try this place. I wonder how they would prepare the Ovaltine drink. Thanks for the post Helen. Hi Y - lol. There was a lot of glistening I had to contend with, especially with the bright lights above, but the steak was very tender if a little peppery! I will definitely go back for wings on that recommendation. Most famous dish? I must get there soon! Hi Forager - I did mention the half-coffee-half-tea drink in the post but I couldn't go there. I tried it in HK and really couldn't understand it. Such a bizarre flavour. Hi Arwen - I can guess what the hot lemon coke would taste like, but I suppose I will have to get one the next time I am there. For research purposes. And to wash down the fried chicken. Of course. I have condensed milk and peanut butter in my pantry so I will have to give this combo a go as well. Hi Belle - Wow, I didn't realise hot lemon coke had medicinal properties! I had presumed the hot coke would lose its fizz. I wonder if they add ascorbic acid or something? Hi Joyce T - lol. Sounds good to me! Hi foodie-central - Ahh uni days. Glad to cast a reminder in your direction. Hope you relive some memories soon. Hi Simon - The menu does sound eclectic but then the idea of normal is definitely relative! Hi FFichiban - I am definitely going to try the PB & condensed milk toast at home! Hi globe trotting machine - Seems like either you haven't heard of this place or you're a devoted fan. Will have to keep an eye out for the pork chop rice with sweet corn next time. Ice milk tea sounds good too. Hi Veruca Salt - I think within the context of the menu, the hot lemon coke isn't all that strange afterall! Hi Howard - I remember being intrigued by Cafe de Campbell but never twigged that it served "HK cafe food". Hi Divemummy - Yes HK cafe cuisine does have a wonderful sense of cultural collision. I really now must try this hot coke with lemon too. Hi Pedro - I imagine the Ovaltine would be made with the usual hot milk, but afternoon tea certainly included plenty of savoury dishes. I'm keen to check out the fried chicken myself! Hi tzigane - I love hidden local secrets. Do tell if you know of any! And I'm not totally regretting not ordering the hot lemon coke now. Will def have to try it on my next visit!